Europeans LOVE to snack in between meals - snack sales in Europe hit $167 million in 2014 alone. But is snacking good for you? The answer is not as clear-cut as you may think. Some experts argue that snacking makes us eat too much sugar and pack on the pounds. Others rave about the many benefits of snacking and claim that it can in fact contribute to weight loss. In reality, it totally depends on what type of snacks you choose. Whereas a soda and a doughnut quickly will obliterate the health boost from a bike ride or trail run, fresh fruits, veggies, nut mixes and other nutrient-packed snacks will help you power through the day like a champion. Extreme hunger can easily cause you to overeat, which is why dieticians often recommend eating smaller meals more frequently throughout the day. Research lends some support to this advice. Several studies have showed that eating just three meals per day can lead to greater appetite versus eating three meals and three snacks. High protein snacks, like almonds and walnuts, appear to have the best effect on curbing appetite. Quick carbs are oh so delicious, but if you’re trying to stay alert and focused at the office all day you should grab something that is high in protein instead. Protein helps our brains produce dopamine and other chemical messengers that keep us energized and attentive. A hardboiled egg, a couple of slices of tofu or a handful of mixed nuts are all brain-boosting snacks that you can feel good about. Snacks like candy bars, cookies and chips are full of quick carbs that raise your blood sugar and give you an immediate jolt of energy. But we all know what comes next – a crash that leaves you feeling sluggish, cranky and distracted. Snacks with slow carbs (low glycemic index), on the other hand, provides steady fuel throughout the day and help prevent dips in your blood sugar. Many fresh fruits and legumes have a low glycemic index, as do peanuts and cashews. Once again, we’re not talking about the kind of snacks that are full of empty calories and send you into a sugar-induced coma. Eating healthy, minimally processed snacks is a great way to sneak in some missing food groups and micronutrients, like fibre, folic acid, calcium, magnesium, iron and potassium. At least one U.S. study has found that snacking is associated with eating a more nutrient-dense diet. Whether you’re a weekend warrior or a serious athlete, your body needs to recover after a workout to become fitter, stronger and faster. Snacking is an important part of the recovery process, as it refuels the glycogen stores in the muscles and liver, builds new muscle protein and red blood cells and allows the immune system to repair damage. A glass of fruit juice, a couple of slices of toast, a fruit smoothie, a can of tuna or a handful of dried fruit, like sweet apricots or mixed nuts will do the trick! 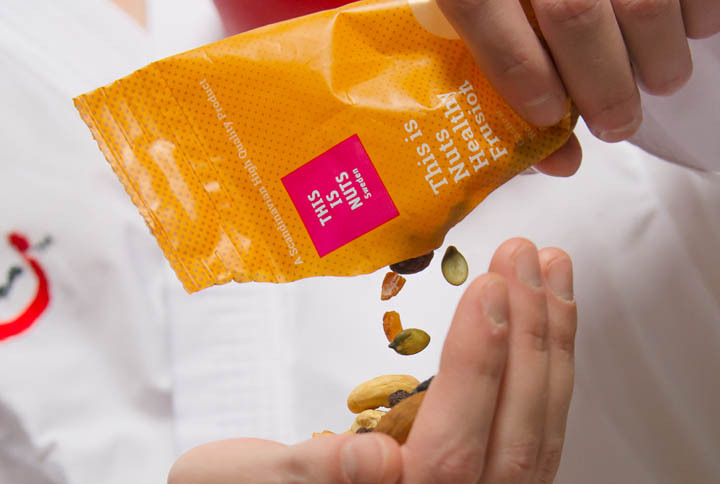 For more tips on how to become a snacking champion check out 5 Rad (And Healthy!) Snacks for Everyday Athletes. You're welcome!